The Service Employees International Union (SEIU) held a boisterous picket line in San Francisco last night, but their chants targeted a surprising adversary: labor leaders and their political allies. While California Democratic Party Chair John Burton (labor’s greatest California ally), State Senator Mark Leno and leaders of UNITE HERE, the Sailors, Plumbers, Building Trades, and Police and Fire unions, were inside the Plumbers Union Hall honoring the National Union of Healthcare Workers (NUHW), SEIU was outside denouncing NUHW – and by implication its supporters – as corrupt. Last week, SEIU informed Burton that it would end its $1 million annual donation to the state Party unless he withdrew his support for NUHW, which he refused to do. SEIU’s threat to labor hero Burton, and its reported statement to the United Teachers of Los Angeles (sponsor of tonight’s NUHW fundraiser) that it would seek to organize charter school teachers in retaliation for UTLA’s pro-NUHW stance, reflects a union increasingly at odds with the labor movement. In July, 25 international union leaders condemned SEIU’s raids on UNITE HERE, and new AFL-CIO President Richard Trumka has since vowed to defend UNITE HERE against SEIU attacks. SEIU is now isolated, viewing fellow unions and pro-labor politicians as adversaries, and its scorched earth campaign against its former California health care leadership is coming at a steepening internal and political cost. On a day when SEIU President Andy Stern joined hundreds of taxpayers protesting outside Goldman Sachs’ DC headquarters, the union he heads engaged in a vigorous street protest in San Francisco against labor leaders, political allies, and other supporters of the labor movement. SEIU’s protest further estranged it from a labor movement that Stern once aspired to lead, and culminates a year when its twin battles against NUHW and UNITE HERE have left the once inspiring union with more critics than friends in labor. When 2009 began, SEIU was generally recognized as the nation’s most powerful union, and Andy Stern was likely the best-known and most politically prominent U.S. labor leader. Barack Obama’s election appeared to usher in a new era of labor union growth, with SEIU and its Change to Win Labor Federation poised for tremendous gains. But SEIU chose a different course. A week after Obama’s inauguration it put its third largest local, SEIU-UHW, in trusteeship, spawning a year long fight with its former leadership, who now operate under NUHW. By April, SEIU had intensified raids against UNITE HERE, creating a bitter war with its once closest union ally. SEIU failed to force UNITE HERE to surrender and affiliate with SEIU, and its raids triggered angry denunciations from fellow labor leaders and the effective demise of Change to Win. 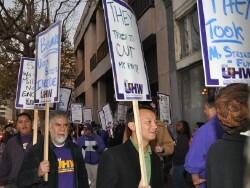 Now, rather than repairing its relations with labor, SEIU is escalating the fight. Its protest last night of longtime allies like John Burton, who has done more for labor and SEIU than any living politician, shows that SEIU is clearly feeling a siege mentality. And while SEIU withdraws funding from the Democratic Party and battles the labor movement, the campaign for the Employee Free Choice Act (EFCA) – once among SEIU’s top priorities – seems forgotten. The Center for Union Facts and other anti-EFCA forces have used SEIU’s blocking of worker elections in California as a prime argument, and even sympathetic politicians are reluctant to wage war on behalf of a divided labor movement. Alleged corruption by NUHW was the major theme, with protesters chanting, “Sal Rosselli you can’t hide, we can see your greedy side.” A number of signs read, “Beware: Union Busters Inside,” a curious claim given how many current union leaders were inside Plumbers Hall. While NUHW and even many speakers referred to the marchers as part of “Andy Stern’s paid staff,” SEIU spokesperson flatly denied this, saying the protesters were primarily members. Trossman also denied reports that SEIU-UHW Trustee Dave Regan required employees, who were brought to San Francisco for a staff meeting earlier in the day, to attend the protest. If SEIU staff did feel compelled to attend, it could be because of the many recent departures of senior field, political and lobbying staff from the SEIU State Council. The State Council is a fraction of its usual size, and not all departures were voluntary. such as filing NLRB petitions blocking worker-initiated decertification elections in over eighty workplaces, or delaying an election for unorganized workers at Santa Rosa Hospital – as thwarting union democracy. The North Bay Labor Council and a coalition of religious leaders also publicly criticized SEIU’s commitment to worker democracy after the union put up roadblocks to an election among unorganized workers at Santa Rosa Hospital where NUHW is likely to prevail. It is not surprising that workers, union leaders, and activists would reject SEIU’s view that workers only have a “free choice” between SEIU and no union. After getting through most of the year without losing a major election to NUHW, SEIU faces new challenges. The union has 10-12 organizers feverishly courting workers at Santa Rosa Hospital, in hopes of preventing an outright NUHW victory in the December 17 election. SEIU’s only hope is to throw the election into a runoff, which could delay matters long enough for the “No Union” side to ultimately prevail. NUHW’s fundraising has grown amidst rising labor movement anger at SEIU, and it now has enough money to fund its current campaigns. The NLRB is soon expected to unblock as many as eighty elections, opening new opportunities for NUHW membership gains and resulting revenue. Even SEIU’s victory among homecare workers in Fresno has come into question. On November 6, NUHW sent a letter to the California Public Employment Relations Board including new declarations charging SEIU with ballot irregularities and misconduct in a race decided by less than 250 votes. SEIU has had a great record of winning such contests, but the newly offered evidence injects some uncertainty into what was considered a closed case. The increasing willingness of other unions to openly back NUHW is most ominous for SEIU. It means that SEIU’s efforts to frame NUHW as a “rogue” labor organization guilty of “raiding” other unions has failed, and that the labor movement now sees NUHW as health care workers’ leading voice for democracy.